A basic understanding of these communication methods, their individual advantages and disadvantages and use cases is a prerequisite for the effective use of middleware and the development of modern, complex systems. 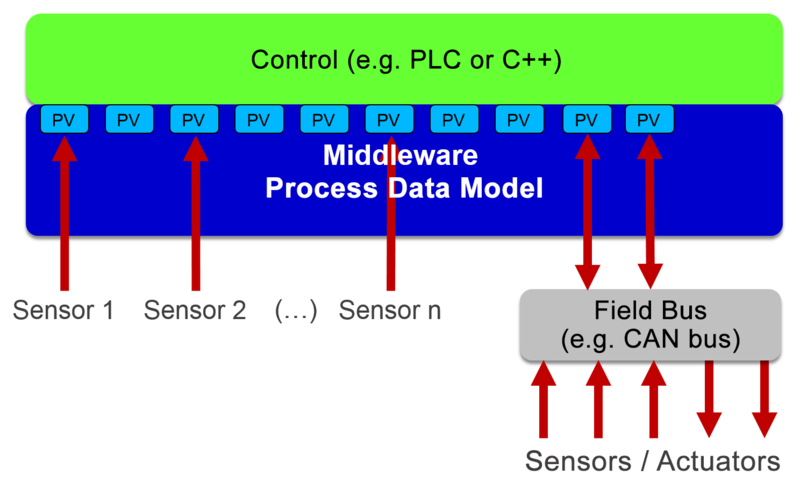 The "shared memory" data model always provides the most recently written value of any variable, making it ideal for time discrete applications like controllers. For this application type, they are the fastest form of communication by far. That is why this method is widely used in PLC controls and test systems. Here, all values are embedded into a fixed structure. This structure is built hierarchically and can thus be used to sort or group data elements or to create a virtual likeness of the actual mechanics. The Gamma V middleware's data model distinguishes itself by its intelligent process variables. These provide a wide range of functions like data logging, I/O mapping, signal on change or software controlled simulation. This helps significantly reduce development efforts by eliminating the need to write bespoke routines for this functionality. The message based communication model provides serialized data and handles connections between processes. 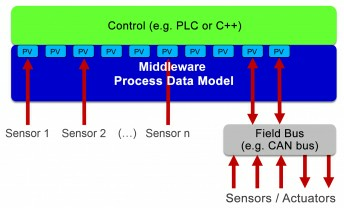 The middleware provides a message broker that conveys messages between processes, sensors and actuators. In networks, the respective message brokers communicate across system boundaries and in turn handle the local distribution of messages to participants. This can take the form of point-to-point or n:m connections. Message connections act as push services so that processes never miss a value change. 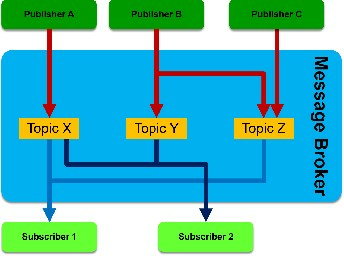 Using the publish/subscribe model, processes can announce themselves to the broker as senders or publishers and define so called topics, which are then used as an outgoing data channel. Receiving processes (subscribers) can subscribe to any available topics at the broker. 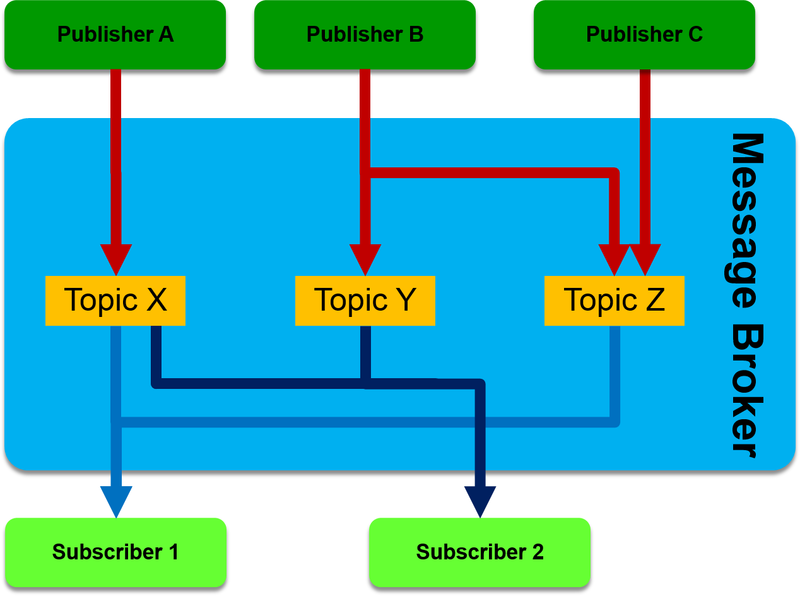 If multiple publishers write to the same topic, their messages are delivered in order of reception. The origin of the data is irrelevant for the subscribers as the only data source they can see is the topic announced by the broker. This allows systems to interconnect to dynamic flexible networks, on a fully semantic base. This method of communication is the backbone of technologies and concepts like Industry 4.0 and Industrial IoT. Buffered data streams are a special case used for specific scenarios. Data streams or FIFOs are a subset of message based communication. They are always carried out as point-to-point connections; data is not serialized and there is no broker involved. This makes these streams extremely fast. The sending process writes its data into a ring buffer that is read by the receiving process. The reader always receives the oldest available value (First In - First Out). At the same time, that value is deleted from the buffer and the next oldest moves up. This method is ideal for asymmetrical communication procedures and transferring extensive amounts of data. This way, a sensor can e.g. give off measurement values with a sample rate of 100 kHz that are fetched and processed every full second. This saves system resources since the reading process doesn't have to wake up for each value change. Another use case are video or audio streams. NB: Every data structure that is handled by the middleware is always based on a data model. However, since Gamma's shared memory based data model offers several special features and functionalities, for the sake of brevity and clarity the term "data model" is only used in this context when referring to Gamma's intelligent process variables. As you can see, none of the three methods is perfectly suited to every purpose. Almost any application can benefit from a combination of two or all three communication concepts. That is why our middleware platform Gamma V not only supports all three forms of data communication but also any arbitrary combinations thereof.